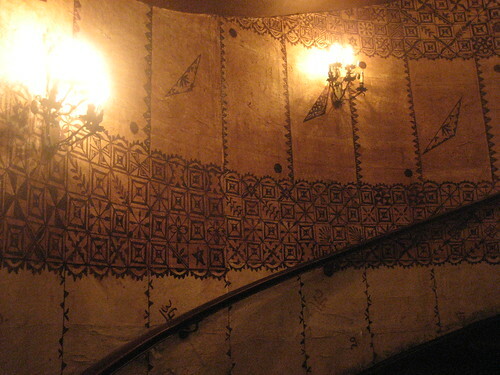 The entrance itself is kind of magical, with a giant chandelier and beautiful tapa cloth wrapping around the staircase that takes you down to the restaurant. 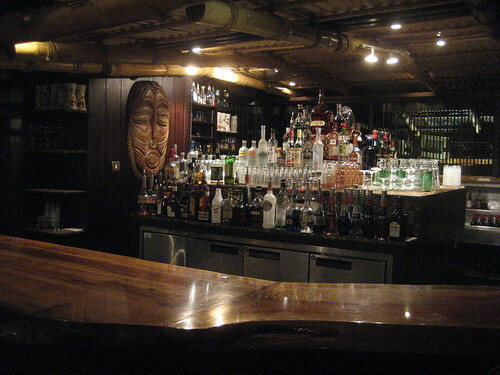 Also at the top is a display case with some of the standard Trader Vic’s souvenirs, but at prices that will make you cringe if your currency is on the weaker side (£20 for the coconut mug!). 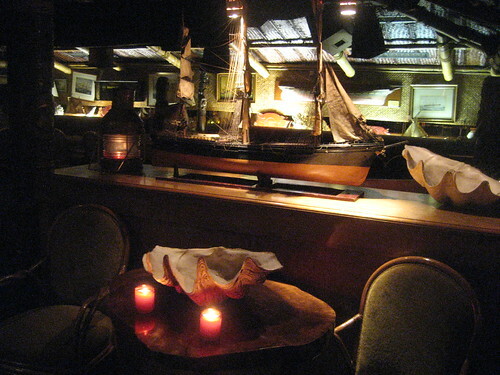 We were seated up on the left in the dining room. 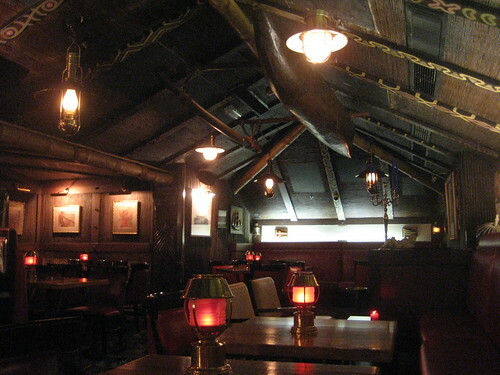 The decor is topnotch, with carved tiki poles, suspended outriggers, fish floats, large shells and bamboo, but I particularly liked the nautical touches of the lanterns, model ships and small yacht club flags along the wall. 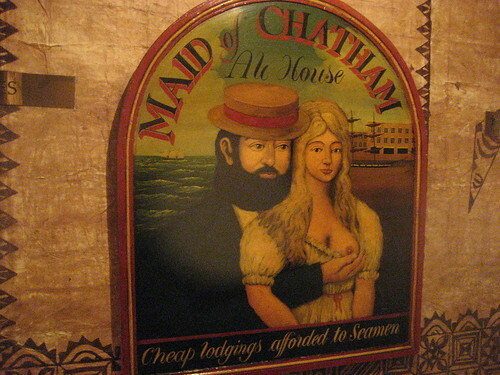 In recent years Trader Vic’s has censored their original menus by making the ladies much more modest, so it was amusing to find this saucy sign. I always like to order the signature drink of that particular Trader Vic’s, and here it’s the London Sour (£9), which Trader Vic himself made for the restaurant’s debut. 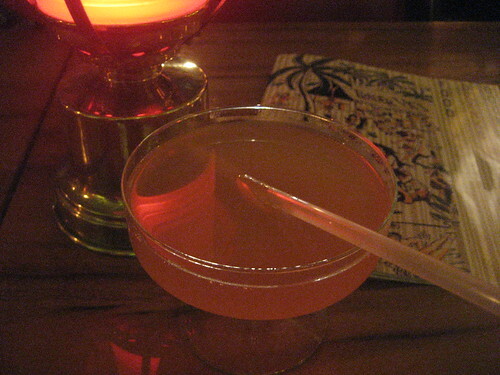 It’s composed of Scotch whisky with orgeat, orange and lemon juice. 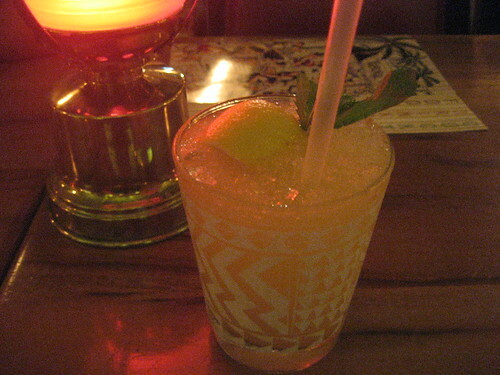 (At other Trader Vic’s, it’s made with Bourbon and dubbed the Eastern Sour.) I don’t drink much Scotch so I was a bit hesitant about this one, but I loved it. The balance between sweet and sour was just perfect. Now if only I had quit while I was ahead. Instead I was intrigued by the section of the cocktail menu that went beyond the Trader Vic’s classics and ordered the Wanilla (£13.50), made with St. Aubin vanilla rum, pineapple, “a touch of Mandarin” and Prosecco. I had hoped for something fruity and bubbly, but there was an artificial taste to this that was a total turnoff. cool! 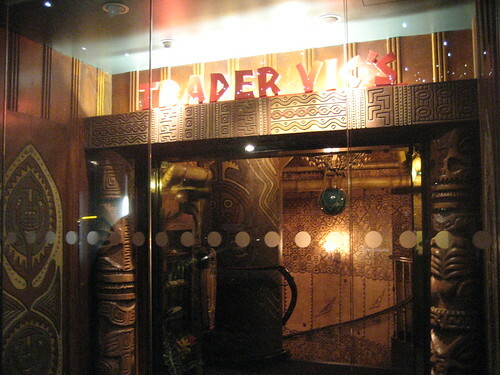 Thanks for posting some pics to go with the recap of your Trader Vic’s London adventure. 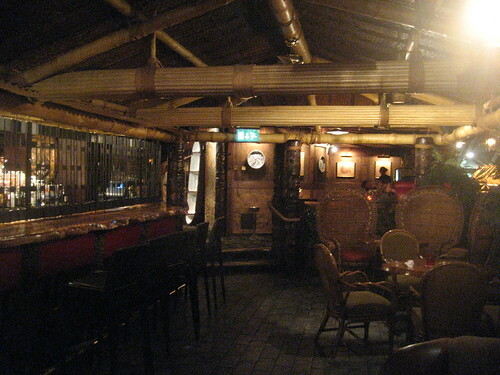 Forget Big Ben- Whenever I finally get to London, TV’s and the Mahiki are on my “Must-see” list. Thanks, Finky! Same here, just wish I could have also fit in Trailer Happiness on our trip. The live music is great!!! I’m a regular client there and I love their music. 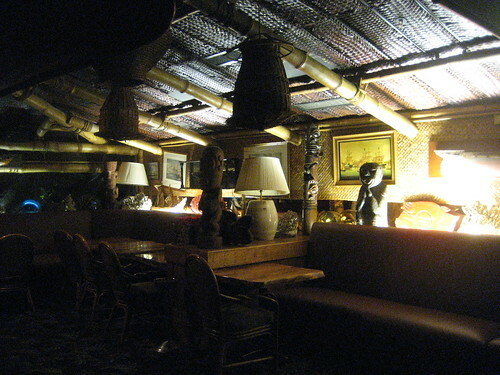 They have all sort of artists performing every night. Shame you don’t like latin music, you just need a couple of tequilas!! !